Is it safe for your dog to eat Celery? Read more to find out. 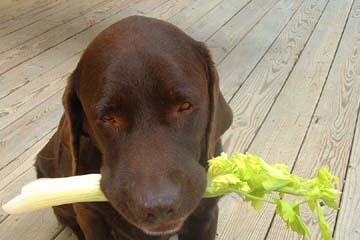 Celery appears to be fine for dogs to eat. Most vegetables are. It’s good for your dog’s diet to feed your dog different kinds of vegetables every once in a while. So celery doesn’t appear harmful for dogs in most cases. Lots of dogs love chewing on a stick of celery. Others are picky and don’t like them. If you want to be extra careful, string the celery before feeding them since it may cause intestinal blockage due to some dog digestive problems. Does your dog like celery? Let us know and leave a comment. 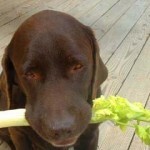 What do other dog owners have to say about whether their dogs can eat Celery or not? See comments below. My poodle mx love his veggies (raw mostly) including celery! I do not de-string but cut into short pcs so no strings more than 1/2″. I have a teacup/toy Chihuahua and she loves celery. Although since she’s so little, I make sure I only give her the inside of the stalk and not the strings of the outside due to her being so young and little. She can’t get enough of it, she also likes it w or w/o peanut butter! I think she would eat it everyday if I let her. My dog just loves celery and carrots, his name is baby.He is a year and 4 months, short haired chawiawaia. I started feeding my mini schnauzers (2) when I was preparing a celery snack for me, saw “the boys” begging for food. I had the ends that I do not eat so I gave each of them a piece from the base of the celery. They both took off, ate it very quickly and now when I have my celery they are right there to get theirs, they love it. My yorkie loves to eat celery too – However, I was wondering if anyone has ever heard of a dog having an allergy to celery – I’ve been giving him celery almost daily over the past several weeks – Also, over the past several weeks, we’ve been dealing with more itching, scratching, and a red pimple-like skin rash around his groin, inner back legs, and ankles that is becoming increasingly more bothersome – He’s been on medication for a number of years for other allergies – He has allergies to mites, mold, grasses, and weeds – My vet has changed his allergy meds 2-3 times recently in an effort to get a handle on this new problem with itching and rash we’re now experiencing and nothing seems to be helping – He’s on hypoallergenic foods and treats, I washed and cleaned his bedding and room very good, I’ve changed detergents to “sensitive skin” types, bathe him weekly, etc – I am stopping the celery to see if his itching improves but was just wondering if anyone had ever heard of celery allergy in dogs. Thanks! I have four dogs yesterday I tryed out celery I chopped it into bite size pieces and omg they just loved it so fun to hear them chew it. Mango was the most enthusiastic he is a little yorkie. They also like carrots. Gotta love your dogs when they eat healthy!!!! I have wire fox terrier mix who loves celery, asparagaus and green beans. He eats much healthier than I do! My golden retriever has numerous allergies including grass and weed. Instead of meds, I wash her paws with water, or water with vinegar every time she goes outside and walk on the grass. I also wash under her chin when she scratches. She loves salary but I am putting her on a sugar elimination diet, including apples and other sweet fruits.Her ear infections have improved a lot. My dog took the stick of celery after dancing for it and ran with it and hid to eat it like it was the best dog treat ever. ALWAYS BE AWARE OF THE DOG’S URINATION FREQUENCY. CELERY IS A DIARETIC. Not for dogs with UTIs, kidney or renal problems. My 8 month Labrador loves celery sometimes I put peanut butter on it and he goes crazy ? Know if dogs can or can't eat Celery? Help other dog owners by leaving a comment.